There are lots of interesting subplots to the NBA Finals match-up between the Cavaliers and the Warriors -- LeBron versus Steph, the Bay Area versus the Rust Belt, and so on. But we know what you're thinking: Yeah, that other stuff is fine, but what about the uniforms? We hear you. As it turns out, this year's Finals offer some intriguing uni-related storylines. 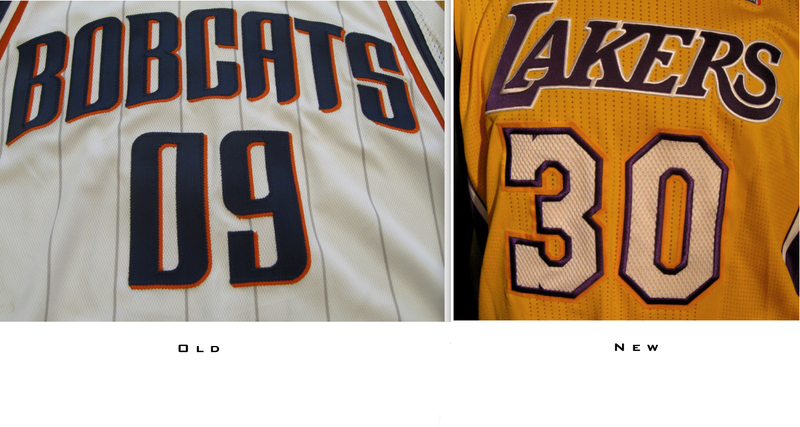 In fact, these two teams have worn some of the best and worst uniforms in NBA history (although their current uni sets fall somewhere in between those extremes). Here's the lowdown on that, along with a bunch of other points to keep in mind while watching the games. Ready? Go! 1. Best. Jersey. Ever. Beginning with the 1966-67 season, the Warriors wore what's now widely regarded as history's greatest basketball uniform -- the fabled "The City" design. What made it so great? The gorgeous depiction of the Golden Gate Bridge on the front, the spectacular cable car motif for the uniform numbers on the back, and of course the odd use of "The City" on the upper chest. It was nonsensical but somehow felt just right. Like, which city? You know -- the city. Still the best basketball uniform ever (and of course it's also the basis for the Warriors' current jersey design, which features a stylized depiction of the Bay Bridge). 2. Best all-star jersey ever. Even if you're a big fan of "The City," here's something you might not know: The uniforms for the 1967 NBA all-star game, which was played at the Cow Palace in San Francisco, were based on "The City." Pretty awesome, right? You can see video highlights from that game here and here. 3. Best warm-up ever. Another thing you might not know: The cable car on the back of "The City" wasn't the only light-rail imagery used by the Warriors during the late 1960s. Their warm-up tops during that period featured a spectacular cable car illustration. 4. Worst uni ever. The Cavaliers' uniforms have had their moments (the design from the first LeBron era, for example, is one of the best-looking NBA uniforms of the past generation). Unfortunately, though, the most notable uniforms in the team's history are the ones worn from 1994 through 1999, which are arguably the worst-looking threads in league history. They've never worn this design as a throwback, and let's hope they never do. 7. And speaking of gold ... This season the NBA added a new uniform wrinkle: Teams that had won at least one NBA championship began wearing by a gold tab on the back collar. The Warriors are already wearing the tab, with the "3x" denoting the franchise's three titles in 1947, 1956, and 1975 (the first two of which were won when the team was located in Philadelphia). But the Cavs have never won an NBA championship, so their collars are tab-free. 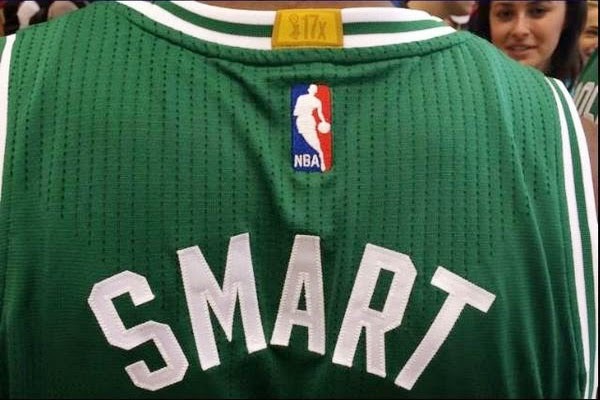 But the little gold signifier will be added to their jerseys next season if they win the Finals. 8. Patchwork. Another uniform change this season is that the league's familiar red, white, and blue logo was moved from the front of all jerseys to the back (which has been widely interpreted as a way to clear space for the inevitable move toward putting corporate advertising patches on NBA jerseys, but that's another story for another day). What does that mean for the NBA Finals patch, which has traditional replaced the league logo patch on the front of the jersey? Sure enough, video game screen shots indicate that this year's Finals patch has migrated to the back, just like the league logo. 9. Don't forget the fine print. 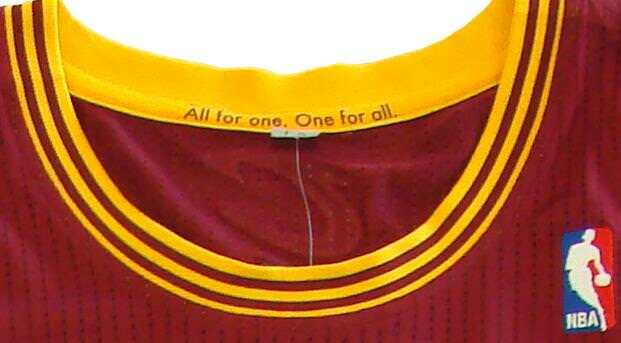 When the Cavs switched to their current uniform set in 2010, they added a subtle detail: The slogan "All for one, One for all" was added to the inner collar. As it happens, that was also the year that LeBron James jumped from the Cavs to the Heat, so the "All for one" line could have been interpreted as a parting shot directed at the man who took his talents to South Beach. In reality, though, NBA uniform designs are already in the pipeline at least a year in advance, so the Cavs had already been planning to wear the collar slogan before they knew LeBron was leaving (and they're still wearing it now that he's back). 11. Nothing up their sleeves. When the league and Adidas were looking for a team to introduce sleeves to the NBA in the winter of 2013, the Warriors gladly volunteered. Those initial sleeved unis looked awful, mainly because the jerseys didn't match the shorts, but the jersey design, viewed in isolation, wasn't bad at all. 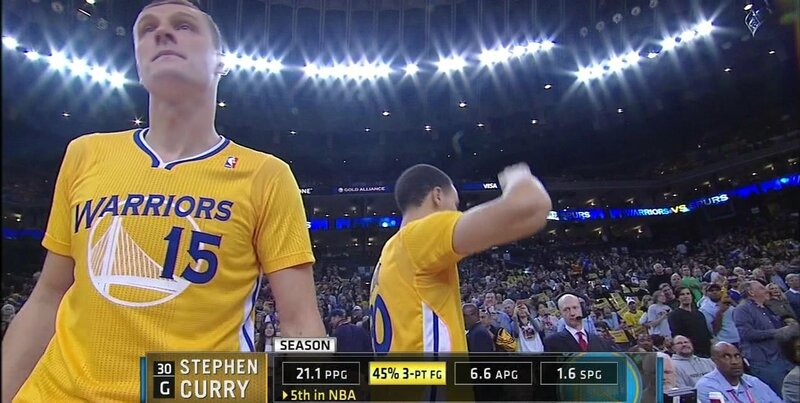 Since then, the Warriors have embraced the sleeved format, wearing four additional sleeved designs. 12. Mix and match. For three seasons beginning in 2008-09, the Cavs experimented with alternate "CavFanatic" uniforms. These were basically mash-up designs that mixed and matched design elements and color schemes from the team's uniform history. It was a fun program, but the team discontinued it after the 2010-11 campaign. Additional notes: There's been a lot of chatter this postseason about LeBron's headband. First he stopped wearing it (and explained why), then he brought it back (and explained why). ... Back around 1990, Golden State's "Run TMC" trio -- Tim Hardaway, Mitch Richmond and Chris Mullin -- served as the team's co-captains, and all three of them wore a captain's "C." ... Beginning in 2010, the fabric used for uniform numbers on NBA jerseys changed from tackle twill to mesh. 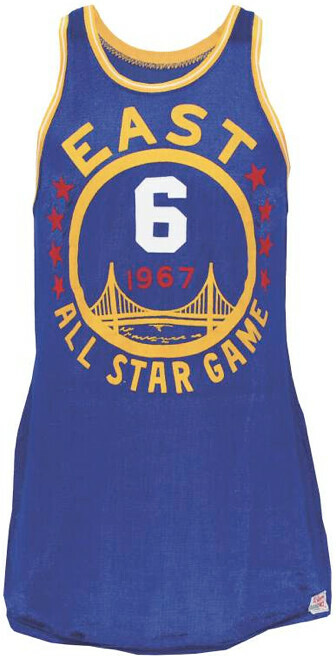 The one exception to that rule has been the Warriors, whose unusual jersey design, with the small numbers inside the circular logo, still uses tackle twill numerals. Paul Lukas wishes the Cavs would go back to their uniforms from LeBron James' first tour of duty with the team. If you liked this column, you'll probably like his Uni Watch blog, plus you can follow him on Twitter and Facebook. 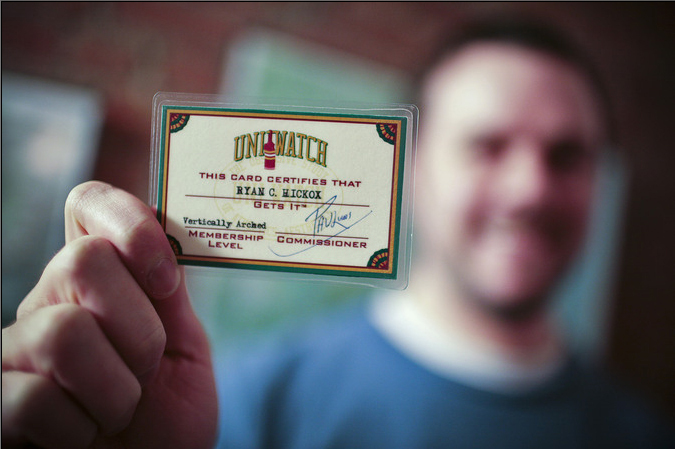 Want to learn about his Uni Watch membership program or his Uni Watch T-Shirt Club, be added to his mailing list so you'll always know when a new column has been posted, or just ask him a question? Contact him here.